Hello Daylight Savings Time - can Spring be far behind? The Splendor of the home where Henry Frick once lived. 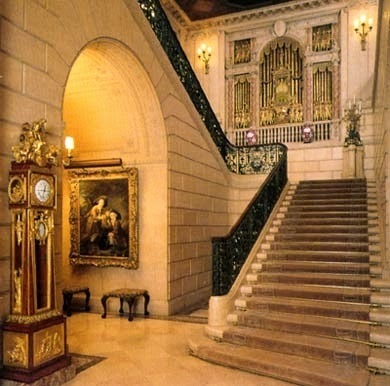 It’s easy to forget that the incredible Frick Collection was once a residence - the home of Henry Clay Frick. Designed and built as a three-story mansion in the Beaux-Arts architecture style between 1912 to 1914. Constructed at a time when almost every building on Fifth Avenue above 59th Street was a private mansion. Although the museum is now showing the incredible Don Quixote Tapestries, our main goal will be to record, the building, the rooms, the furniture, the look and feel of the opulent early 1900's. In some ways this is New York City's version of the world captured in the Downton Abbey series. Avengers Mansion. When occupied, the mansion was originally the Stark family manor, until their only son, Tony Stark, inherited their fortune and soon took on the guise of Iron Man. When: Sunday at 11 AM until 3:15 PM. Sleeping Late? Come anyway - join us when you can. Lunch: Bring your own - eat in the garden or across the street in the park. Show and Tell: 3:15 walk to the Nespresso Boutique Bar, 761 Madison Avenue near 66th Street to share drawings, good stories and coffee, tea or wine if you're so inclined. Cost: On Sundays, pay what you wish from 11:00 a.m. to 1:00 p.m. Directions: The nearest train is the Lexington Avenue Subway No. 6 local to Sixty-eighth Street station. See map for walking directions to 5th Avenue and East 70th Street. Rules: All visitors, including groups of art students, are permitted to sketch in the galleries of The Frick Collection on paper not to exceed 12 x 18 inches and with charcoal or lead pencils only. If individuals need to sharpen their pencils, they must use their own boxes to collect the shavings. Oh, what a great place! I will put this on my list of places to visit when I finally get to visit New York! !